"The best result is that Obama gets the Russians to own this problem" and other strategic possibilities. Last week I quoted an Ukrainian-American reader on why he thought Putin was, for the moment, outplaying Obama in the multi-dimensional chess game for world opinion (not just within-US sentiment) about Syria. Three responses from readers, building to another application of the chess metaphor. 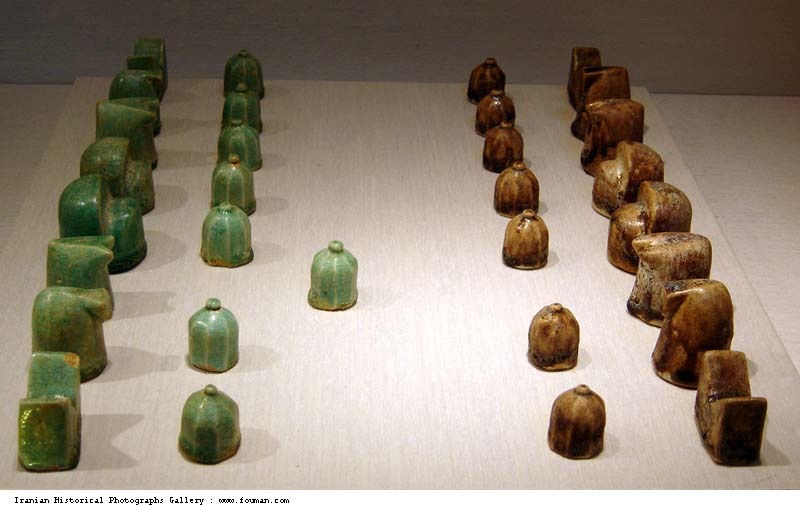 In case you're wondering, that's an ancient Iranian chess set. Putin’s hypocrisy is blatant but his strategy was excellent. Most Americans seem clueless that the world does not see us as we see ourselves. They also missed that while writing in the New York Times he wasn’t writing for Americans. I was born in Moscow, came to US at 17, and now am an American citizen married to an 6thgeneration American living in Washington state. So I read the previous item with keen interest, since it was written by someone from my own background. I read President Putin’s editorial and it was very similar to what I’ve been saying to my family (when my wife is in the mood to listen to politics that is) and to my friends. The talk about america’s – or anyone else’s – exceptionalism always rankles me. I was raised to think that as Soviets we were exceptional, now I hear that USA is exceptional. I traveled around the world enough to see that every country and every group people are exceptional in one way or another. Yes, America is exceptional, but the exception is that it’s built on a vast, rich platform that was fortunate to be here for the taking over last few hundreds of years, and it is surrounded by a whole lot of water protecting it. Yes, Russia is exceptional, it’s vast and it’s ancient, and it’s frozen, and you don’t want to be stuck in a land war there. Yes, Switzerland is exceptional in the amazing amount of money they have and ability to stay neutral through whatever is thrown at it. Yes, Israel is exceptional in being a birthplace of 3 religions and a major pain the rear as result of that. France is exceptional for its cheese and wine. So on and so forth. What I do not like building a foreign policy on “we’re so exceptional, that sun is shining from our orifices, and we can do whatever we want and we can police the world”. That’s just asking for people to come and take a go at you, and taking a swing the world had, and we’re in for more if I am not mistaken. I think that your reader’s comments regarding Putin and chess are very perceptive, and that Putin appears to be winning, but ignores that that Putin and Obama have vastly different goals and starting positions. To put it in chess terms, it’s like Obama came to the board having lost a lot of his pieces and now looks to lose his Queen. At the beginning of the administration, Obama’s tried to rebrand the USA as peaceful, rather than warmongering. This has not worked. Internationally, the US has repeatedly inserted itself into problems in the Muslim world, and found itself blamed for the outcome by each side (Afghanistan, Iraq, Pakistan, Egypt, Libya, Yemen, Somalia, Bahrain etc). The NSA leaks have alienated public opinion across the world, and feed into the image of a global hegemon. Major allies want out. Israel is still mess. Domestically, Obama’s ability to avoid war has been limited by hawkish/interventionist interests, and a press stuck in the old paradigms. Now, both international and domestic opinion is against US intervention in Syria. The majority of the US public of all political persuasions is opposed to any sort of intervention. The military is opposed and Congress would vote against intervention. Internationally, many allies are opposed to active intervention. Those who support of intervention are largely the Sunni despots behinds the nastiest Sunni fundamentalists. By saying no to war, Obama gets out of a sticky mess, rebrands the USA as peaceful at the same time as things are winding down in Iraq and Afghanistan, and now is working well with the Iranians, who are our real concern. The best result is that Obama gets the Russians to own this problem. The central problem with Syria was that Russia had blocked any intervention at the early stages, when a peaceful resolution was possible. Yet Russia has not had to bear much negative effects for its actions. Now, it does. It’s also looking great vis-à-vis Iran. Iran is still a serious strategic threat. Iran’s fear is the Sunni Arabs. The US fear is Iranian WMD. Walking away from Syria assuages Iranian fears about US/Sunni alliances against Shites. The Iranian public is against the excesses of Assad, and the leadership is condemning WMDs. The USA is talking more seriously with Iran, and now has a better chance of some deal than it has had in a long time. The US was never going to get what it wants in Iran through military means (barring an extremely costly and possibly nuclear strike) and now a diplomatic solution seems possible. “Losing” in Syria looks a lot like a big “win” for Obama. Sometimes in chess, the best thing is to sacrifice your Queen, and checkmate the next move. Thanks for these. An updated analysis from William Polk coming later today.